Performing Arts > Theater > History > Compends, outlines, etc. 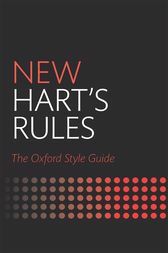 For over a hundred years, Hart's Rules has been the authority on style, helping writers and editors prepare copy for publication. The latest edition of this guide has been updated for the twenty-first century using the resources of Oxford Dictionaries and with the advice of publishing experts.Twenty-one chapters give information on all aspects of writing and of preparing copy for publication, whether in print or electronically. New Hart's Rules gives guidance on a broad range of topics including publishing terms, layout and headings, how to treat illustrations, hyphenation, punctuation, and bibliographies and notes. All chapters have been revised and updated to reflect current practice (taking into account changes in the world and in the publishing industry over the lasteight years), with the help of a team of experts and consultants. Chapters that have been particularly heavily revised include those dealing with the use and presentation of illustrations, with the conventions of scientific publishing, and with the art of indexing. Additionally, an entirely new chapter has beenwritten to explore and summarize the differences between UK and US English.The text is designed and organized for maximum accessibility with clearly displayed examples throughout. Authoritative and comprehensive, and endorsed by the Society for Editors and Proofreaders, New Hart's Rules is the essential desk guide for all writers and editors. Together with the New Oxford Spelling Dictionary and the New Oxford Dictionary for Writers and Editors it forms the complete editorial reference set.